Why in the world would you want to make your own pumpkin puree? I mean, they sell it in cans at the grocery store, you know the same place they sell the fresh pumpkins you want to kill and cook to make fresh pumpkin puree. 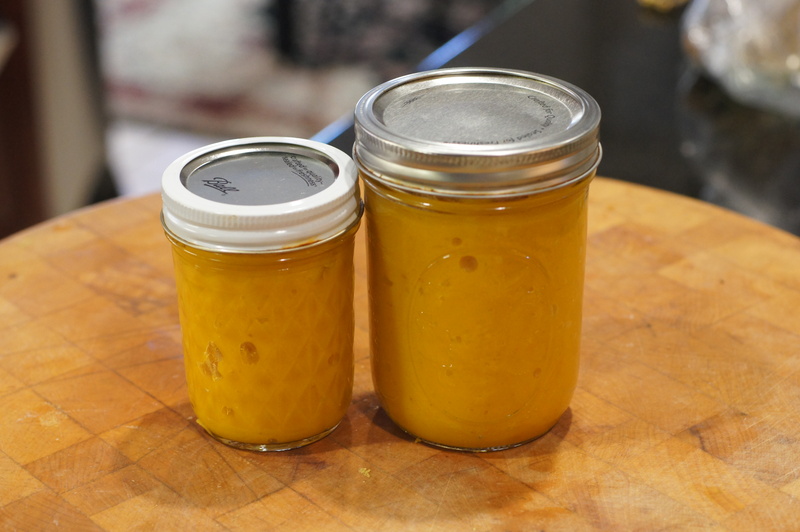 Chefs and home cooks rave about the convenience of canned pumpkin. Why in the world should I bother with my own? A lot of people ask that very question. Now let’s not get confused with the term punkin’, a Southern euphemism for sweetheart, baby cakes, honey bun, etc. This is a food blog after all. We’re talking about eating pumpkins. Of course, this eliminates “jack-o-lanterns.” These are vastly large, watery, fibrous, pumpkins which, while edible, shouldn’t be eaten. They are perfect for ghastly faces illuminated by candles at Halloween. They are very bad for pies and other culinary uses. Now, if you go to the grocery store you can find cans and cans of pumpkin puree all of them telling you they are 100% pumpkin. Unfortunately, there is a very fuzzy line between what is a pumpkin and what is a squash. For instance, a little research will tell you that there are 3 primary varieties of winter squash, Cucurbita pepo, Cucurbita maxima, and Curcubita moschata. I’m sure you are asking, So what, we’re talking pumpkins here? Well, Cucurbita pepo includes the gourds we traditionally think of as pumpkins, such as the kind used for jack-o’-lanterns, among others. Cucurbita moschata includes butternut squashes, as well as the Dickinson pumpkins used by Libby’s, the producer of most of the canned pumpkin in North America. So, with that information, now you ask in earnest “what’s a pumpkin?” To help you answer your own question, here’s a little quiz. Which of the following are not pumpkins? If you said, Cucurbita Dafficus Duckus, the black thing with the large yellow beak on the left, you are correct. That is not a pumpkin nor is it edible. But what about the white one with orange stripes? It was sold at the market with the rest of the pumpkins. Yes, it is a pumpkin. It’s called a Lil’ Pump-Ke-Mon Pumpkin. It is a decorative pumpkin that is also edible but is not particularly sweet. So, what about the little orange globe looking things? They look like pumpkins and now you are confusing me. The small orange globe is also a pumpkin called a Pumpkin Wee Be Little. It is a member of the Cucurbita pepo variety but this one is good for cooking and decorating. It’s just not as good as sugar pumpkins. Hang on now. The only ingredient you listed is a pumpkin, right? You’ve got to be kidding. You have confused me with endless BS on varieties of pumpkins and all you tell me is 1 nondescript, singular pumpkin. Yep. That’s it. There are so many varieties of pumpkins on the market that are edible and have differing characteristics in flavor and texture. Try them. 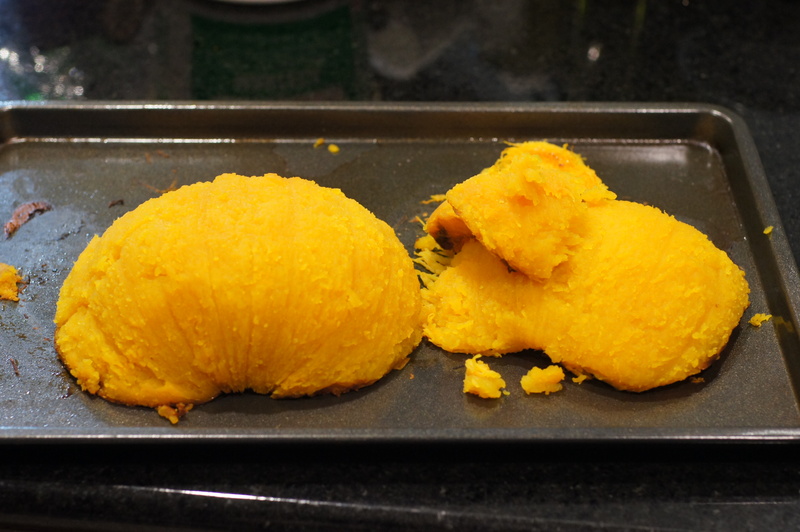 The manner of making pumpkin puree doesn’t change. In the Fall, pumpkins are fresh and abundant. 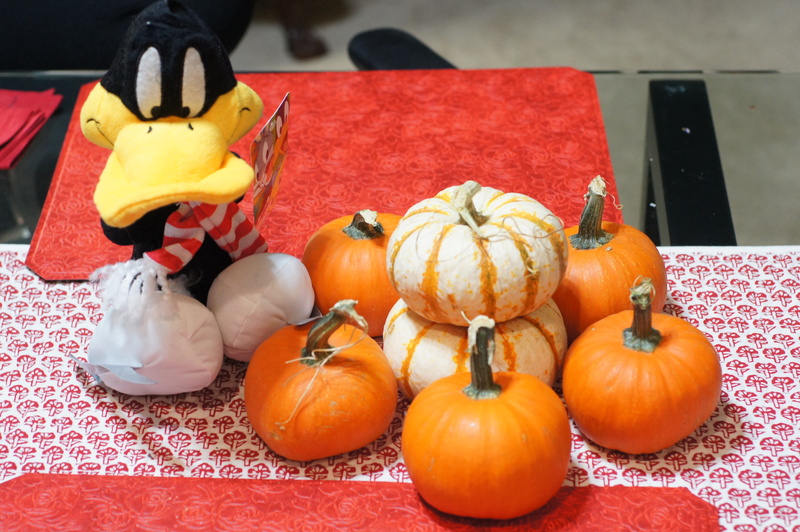 I will make puree with all of the quiz pumpkins, except, of course, Daffy Duck. Blech! Once you make the puree you can do the unthinkable and “gasp” taste it. Once you taste it, you can decide whether it is better for a pie, a sauce, a soup, even risotto or pasta. Your imagination is your only limit. Don’t be bashful or afraid. Nonetheless, if all you are interested in is pie and being safe, then change the ingredient to 1 sugar pumpkin. These pumpkins have a natural sweetness and are not overly fibrous or watery. They make wonderful pumpkin pies. OK. Now that we have resolved that issue, cot off the stem, split the pumpkin in half vertically, i.e. from flower to stem, and seed it. If you like roasted pumpkin seeds, pepitas or pepian, keep the seeds for later use – another post at another time. 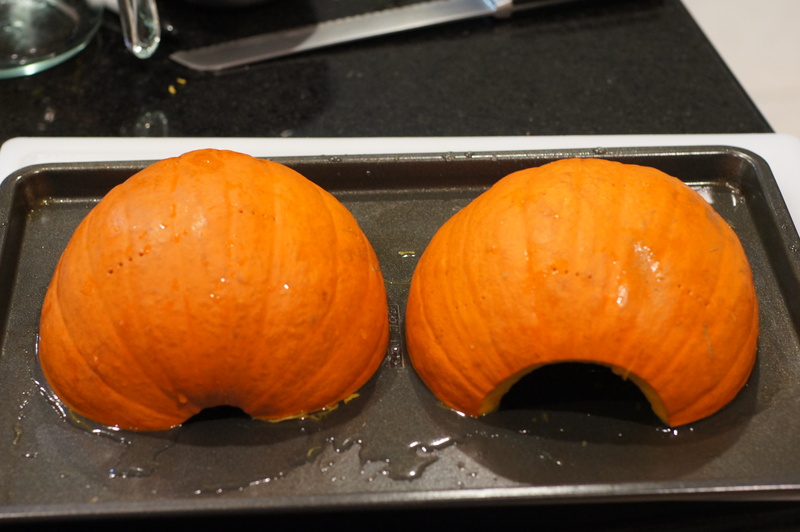 Once you have prepped the pumpkin, lay each half down on a baking sheet with 1/4 cup water. Place is a preheated 375 F oven for 45 – 60 minutes. You can tell it’s done much like a potato – insert a toothpick and if it goes straight through with little to no resistance, it’s done. When done, remove from oven and allow to cool. Once peeled, you have several available options. You can dice it, you can mash it or you can make puree, which is this post. So, to make puree, put it in your food processor and process it until thick and smooth. If you have used a sugar pumpkin, you’re done. It won’t be watery. If you have chosen another pumpkin that it watery, then pour in a strainer and let the water drain until you reach the desired consistency. Put in appropriate sized jars and refrigerate until needed. It will keep in the refrigerator for 5 days and freeze for 3 – 4 months. I totally agree why buy can when you can make your own with no preservatives and taste 101% better. 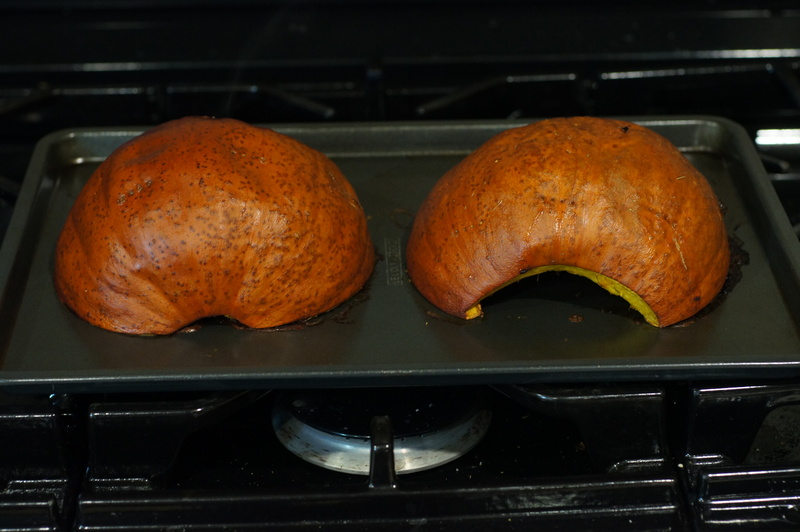 This year I roasted my own, it took me a day because it was huge but I made pumpkin bread, cupcakes and Tikvenic (Bulgarian Pumpkin Pastry)…well worth it! Ok that is pretty simple. I really don’t have an excuse not to try this next year. Or even for Christmas. Yep. It doesn’t get much simpler and the puree is much better. Give it a try and tell me if you can distinguish between canned puree and fresh. What do you use pumpkin puree for? I only ever eat pumpkin roasted. I have never made pumpkin with dessert or baking. You use pumpkin puree for any of a variety of pumpkin pies, pumpkin creme brulee, apple pumpkin sauce for rabbit (or other proteins), other pumpkin sauces, pumpkin soups, etc. Thanks Richard, this was a very useful post for my first pumpkin pie 🙂 It arrived while I was shooting the ingredients for the post. I was planning to roast the pumpkin (because I hate peeling the buggers!) but this was even easier and more appropriate. Great exposé on types of pumpkin. This one was organic was all I know, and I thought it had the right consistency without squeezing out any water. You’ll probably be able to tell from the photo in my post. It goes without saying that I completely agree with you regarding making your own pumpkin puree rather than purchasing a jar! Hi, Stefan. Glad you found the post informative/useful. I look forward to reading your pumpkin post. I’ve only ever tried a ‘pumpkin’ themed dessert once in my life and that was pumpkin pasties for a Harry Potter party. As we can’t buy varieties of ‘canned’ pumpkin here, I’m proud to say I had to make it all from scratch. It was a few years back, but I sure wish I’d known your technique on how to bake them whole and extract the juice/pulp. Hi, Alice. I’m sure your pumpkin pastries were much more than edible. Remember, I read your blog. 😉 I’m not a huge fan of pumpkin but its Fall and pumpkins are abundant and readily available. You just have to use them. They are pretty good in a pumpkin creme brûlée and make a pretty good ice cream, as well. I love it when you get the small ones and serve a pasta or soup and use the small pumpkins as individual serving vessels. What are your favorite recipes for fresh, pureed pumpkin? I have a big bag in my freezer. I do a Caribbean spice pumpkin soup that is pretty darn tasty, https://remcooks.com/2013/10/30/delicious-pumpkin-soup-with-a-caribbean-flair/. Although it calls for cubed pumpkin that is later pureed, you can use puree. I do a couple of pumpkin pies, the sour cream pumpkin pie is super killer, https://remcooks.com/2012/11/23/sour-cream-pumpkin-pie/. I’m a real fan of pumpkin ice cream. I have a rabbit with pumpkin dish I may post next month. It’s wonderful with risotto. You could use it as a stuffing for a ravioli. Pumpkin bread is also really nice. Hope this helps.